We have often cautioned against underinsurance. And it doesn’t help that there is sometimes confusion between a Buildings Declared Value (BDV) and Sum Insured, one or both of which will appear on your policy document. Let us try and help to clear up any confusion. Your Policy schedule may show two values: a Declared Value and a Sum Insured. The difference between these two figures is simply how the contract you have with your insurer handles inflation during the insured period. Buildings Declared Value, or BDV, is the total amount you are covered for to rebuild your property on Day 1 of the policy following a total loss. For example, your BDV is £500,000 and on Day 1 of your policy you suffer a total loss. In this instance, you are covered for up to £500,000. The Sum Insured, on the other hand, includes an inflationary provision which is called a Day 1 Uplift. This is based on the cost to rebuild your home on Day 1, should you suffer a total loss PLUS an uplift to cover the cost of any increase in the cost of materials, labour etc, during the insured period. So, for example, if you are covered for £500,000 on Day 1 of your cover, but you suffer a total loss on Day 364 of your cover – and by this time costs may have increased by, say, 10% – your Buildings Sum Insured cover may be for £550,000. This is why there is a difference between your Declared Value and Sum Insured. And this is why it is SO important when comparing quotes to ensure you are comparing the Buildings Declared Value and NOT the Sum Insured. When a policy is on a Day 1 basis for example, you are asking a broker to quote on the Sum Insured, which means the premium they negotiate is likely to be higher and you won’t be comparing like-for-like. If you discover that your policy documents contain only a Sum Insured figure, if you ask your insurer they must tell you the rebuilding cost figure that they are basing the premium on. At Deacon, we will always tell you your Buildings Declared Value. Having established that your premium should be based on your Buildings Declared Value (BDV) and not Sum Insured, to then assume that automatic indexing will keep your block of flats’ BDV up to date can be a big risk. It’s a good idea to get your property revalued every three to five years. We understand this can be a big expense, so we have negotiated special rates with a professional company regulated by the Royal Institution of Chartered Surveyors. In the vast majority of cases, drawing on the wealth of information about property that is a now available online, they are able to provide surveys following desktop research, avoiding the need for a more costly site visit. Find out more about our new offer HERE [LINK]. 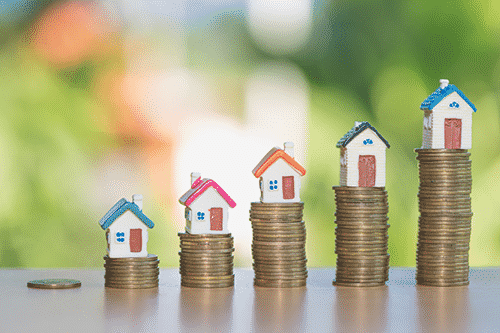 Why do you need an up to date valuation? Most of us are aware that we need to know what our building is worth before insuring it, but it can be easy to get confused between the market value of our flats and the amount that insurers are interested in which, unlike market value, is the cost of reinstating the whole building from scratch following a total loss. The Buildings Declared Value (BDV) can often appear to be relatively low when seen in the context of the market value of a block of flats. Nevertheless, it is very significant because insurers use it as a benchmark for all claims. For example, if you have storm damage to the roof or an escape of water affecting multiple flats, and are found to be underinsured by, say 25%, then any claims payment could be reduced by the same proportion. In our experience, the benefits of ensuring your buildings declared value is correct far outweigh the cost of cover. An out-of-date valuation is likely to be a false economy should you need to make any sort of claim. A professional valuer will give you an honest figure. Another advantage of having a revaluation is that it will normally be done by a professional surveyor, so it is also a health check for your building – and insurers may also take into account contributory neglect through lack of maintenance when assessing any claim. The industry index linking figures provided for flats and houses is only an ‘average’ for the country as a whole and takes no account of, for example, variations in building styles and materials or regional differences. Automatic index linking only works if you have the right starting point and even then it cannot be relied on indefinitely. For more information about our insurance valuation service you can view our fact sheet here. Alternatively, you can call us on 08000 92 93 94 or email info@deacon.co.uk and we’ll be happy to help.